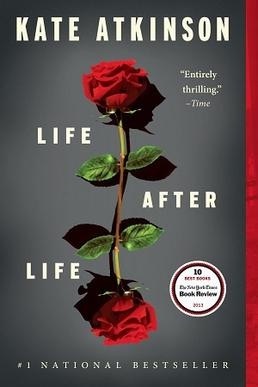 Metaphorically speaking, it has taken me a couple of “life after life” to read this book. I started reading it in the Spring of 2018, went through multiple iterations of “pause, resume”. I hit obstacles (elsewhere), fell over and picked myself up, occasionally with bruises. Being clumsy or graceful, either has its beauty. Who cares whether I am covered in mud or my knees are bluish-purple? Back on one’s feet is a great statement itself. There is life, life after life, life after life after life, life after life after life after life… The time sequence of each life ends with darkness. Would you be able to live a better life according to any desired metrics if you had multiple chances instead of only one shot? None of us could have the many lives that Ursula had in the book. But we are free to free ourselves from the shackles of this life. Do not get me wrong. By that, I mean, we are free to make changes and start something new in one corner of our life, however small and inconsequential it might seem at the time. The number of monarch butterflies overwintering in Pacific Grove has dropped drastically recent years. For the last two years, I did not have the good fortune of spotting any clusters of them. I learned that it takes four generations, each generation going through four stages of life cycle: the egg, the caterpillar, the chrysalis, and the adult butterfly, along the migration route from north to south each year. Many factors could critically affect their chances of survival and reaching overwintering sites. The devastating wildfire in Northern California destroyed the natural forestry that the third generation of monarch butterflies relied on enroute to Pacific Grove in 2017. Subsequently fewer monarch butterflies (of the fourth generation) were present at the sanctuary in the peak viewing time, as informed by one docent. Given that we can neither be Ursula (with multiple lives of variable lengths and variable versions) nor a monarch butterfly (short lived but multiple generations per year), what shall I do with mine? What will you do with yours? A bit more laughter, on the ridge or in the trough, I will start there. No point in thinking, you just have to get on with life. We only have one after all, we should try and do our best. We can never get it right, but we must try. Life wasn’t about becoming, was it? It was about being. I feel as if I’m waiting for something dreadful to happen, and then I realize it already has. Whatever happens to you, embrace it, the good and the bad equally. Death is just one more thing to be embraced. You can step in the same river but the water will always be new. Pamela’s life would go on after she was dead, her descendants spreading through the world like the waters of a delta, but when Ursula died she would simply end. A stream that ran dry. “Well, we all get on,” Sylvie said, “one way or another. And in the end we all arrive at the same place. I hardly see that it matters how we get there.” It seemed to Ursula that how you got there was the whole point. In her head she’s always on the stage. She is her own theatre.